The Kennebec County Sheriff's Office on Tuesday released a photo showing the man who robbed the Border Trust Co. bank on Route 3 last week. The Kennebec County Sheriff’s Office on Tuesday released a photo showing the man who robbed the Border Trust Co. bank on Route 3 last week. The man, armed with a handgun and wearing a dark ski mask, pedaled a short distance on a bicycle and jumped into a white pickup driven by another person and sped away, police said. The robbery happened shortly after 10:30 a.m. Friday. Capt. Dan Davies of the Kennebec County Sheriff’s Office said Tuesday that police had no new information to report on the case. Davies said the department’s Major Crimes Unit is investigating leads. 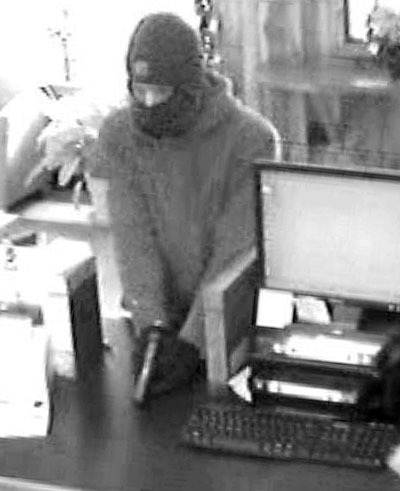 In the surveillance photo released by police, the man is holding a handgun with both hands and the gun is pointed down at the teller’s counter. Only his eyes are visible through a slit in the ski mask, which covered his nose and mouth. Police described the light-haired, light-eyed white male as between 5 feet, 10 inches and 6 feet tall, weighing 170 pounds, and wearing jeans and a brown Carhartt jacket. Davies has said that the man showed a teller at the bank a gun and demanded money. He fled out the front door with an undisclosed amount from the three tellers. None of the tellers were injured, but they were shaken by the incident, Davies said. There were no customers in the bank. Deputies were on scene at 368 Route 3 about two minutes after the robbery was reported, Davies said. A witness who lives nearby reported seeing a man wearing a ski mask pedaling a bicycle north on Jones Brook Crossing toward Village Street, then ditching the bike and being picked up by someone driving a white pickup truck. Officers and a tracking dog searched behind the bank and found a bike in a ditch. Police asked that anyone who has information on the robbery to call the Kennebec County Sheriff’s Office Major Crimes Unit at 623-3614, ext. 215.